This month we installed the world’s first VR ARENA esports attraction at Pinballz, a family entertainment center in Austin, Texas. A total of 820 guests played in the first 10 days, generating revenues of more than $10,000. Although these results cover only the first 10 days, these initial numbers illustrate how proper marketing around an attraction’s launch can attract a new audience and new money to your FEC: gamers! VR can attract a new audience of gamers to your FEC that may rarely or never have visited before. The advertised launch event for VR ARENA at Pinballz produced 170 pre-registered guests who came specifically to try it out. 45% of these guests had never visited Pinballz before. We spent a total of $120 on Facebook and Instagram ads for the launch of VR ARENA at Pinballz. Using an exciting 60-second video clip (see below), we targeted people aged 16-50, living within 30 miles of Pinballz, whose interests included gaming, virtual reality, Virtuix Omni, or PlayStation VR. The results were impressive. The campaign reached 20,200 impressions, a 10% video watch rate, and 200 clicks. 42 guests at the opening event reported that they came because of social media ads (30 Facebook, 12 Instagram). In short, $120 of advertising drew 42 guests to the FEC, an acquisition cost of only $3 per guest! Email addresses prove to be valuable marketing assets. At VR ARENA’s opening night, 69 guests (38%) reported attending in response to a direct email they received. Thanks to VR ARENA’s cloud-based infrastructure, on average 70% of VR ARENA players create a user account. This means that VR ARENA operators will receive an estimated 1,000 to 1,500 unique email addresses each month, including birthdays. This data creates direct email opportunities like birthday rewards and touchpoint campaigns. Unique to VR Arena, these newly acquired email addresses can be used for direct emailing campaigns focused on advertising the attraction’s weekly and monthly esports competitions. These campaigns, enhanced by the draw of big prize money to be won each week, can get repeat players to your venue several times per month. After guests arrive at your venue, esports-based prize contests are a great way to entice them to spend more money. At Pinballz, on-site ads for VR ARENA’s esports contests included attraction-side banners, venue entrance flyers, restaurant TV videos, and restaurant napkin holder inserts. 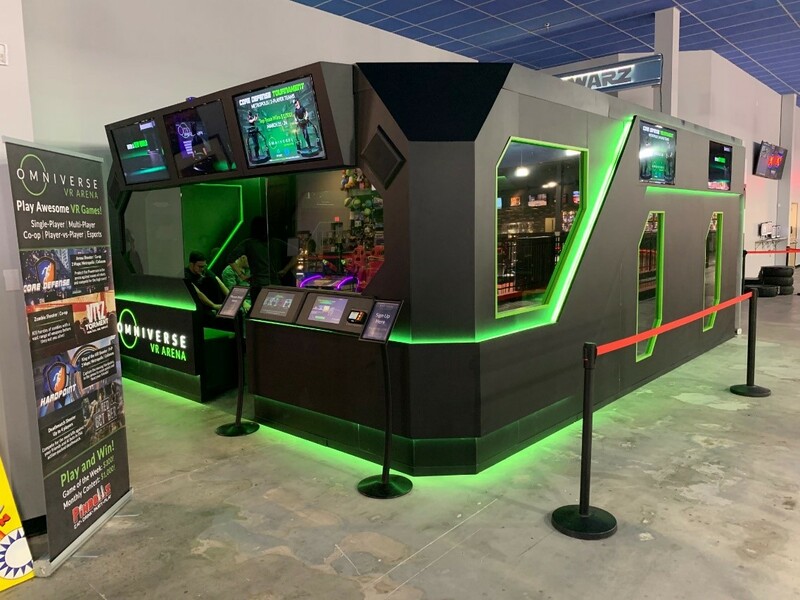 VR ARENA features cloud-based Omniverse ESPORTS™ infrastructure that stimulates repeat play on average 7x with an annual prize pool of $50,000 in cash, plus product giveaways by our sponsors HP and HTC. On-site advertising alerts guests to these contests and prizes, and prompt them to play (and replay!). In the FEC business, new attractions have a track record of cannibalizing revenue from existing attractions, resulting in a minimal net revenue gain. In contrast, well-managed esports tournaments – such as VR ARENA’s prize contests – entice your customers to spend more money (money they wouldn’t otherwise spend). When you offer a truly fun and unique experience, why discount? Pinballz charges guests $15 per play for VR ARENA ($12 in a combo package). The ticket price includes not just the VR game, but incorporates a complete guest experience that gives players that feeling of value. The attraction features a pre-game staging area and post-game social sharing stations that lengthen the experience to 20 minutes, during which guests interact with the game, other players, and the attendant. To accommodate large numbers of guests without waiting-time complaints that may put downward pressure on ticket prices, an effective queuing system is essential. VR ARENA achieves a steady throughput of 20-24 players per hour, and thanks to our custom-designed queuing app, guests don’t need to wait in line. Instead, they receive a text message when it’s their turn to play. The queue fills up quickly during weekends, keeping the attraction at 100% utilization for hours on end at a price of $15/play. Tip 5. Excite Your Staff! Finally, the success of any attraction rides on the excitement of the staff who run it. An excited operator takes game experiences from good to great with their infectious enthusiasm. Fortunately, good VR games offer a thrilling experience that staff themselves enjoy, so most are eager to operate the attraction – exciting your staff about VR is as easy as strapping them into the VR attraction itself. At Pinballz, Virtuix spent ample time ensuring that all staff, including the restaurant and bar staff, played VR ARENA at least once. It’s important that all staff members – not just the attendants – can explain the experience to guests with enthusiasm and confidence. Potential players sitting at the restaurant asking the bar staff, “What’s that new attraction?” will receive a much more enticing answer if staff can speak from personal experience instead of just speculation. Visit Us for a Demo! Your next opportunity to try the Omni 2.0 VR experience is at Amusement Expo in Las Vegas on March 26-28! Can’t come to the show? Try out VR ARENA in Austin! We’ll arrange for your hotel and, if you purchase a system, we’ll reimburse your flight expenses! Virtuix CEO Jan Goetgeluk will present more data and insights from VR ARENA and Omniverse ESPORTS™ at a deep-dive educational webinar hosted by industry expert Bob Cooney on Thursday, March 21 at 2pm Eastern Time. Contact us for a demo and to learn more about how esports can increase revenues for your business in 2019!